This year – the first of our Baronage – ended on a wonderful high with November Crown, but we would also like to reflect on some of the other achievements and notable moments of the year in this, our last letter for 2017. We have welcomed new officers and thanked old ones for their service, but the cycle continues and the position of Seneschal is now looking for a replacement. We have thanked the first members of our Guard and our personal attendants for their year’s service as they stepped down, and welcomed new ones. 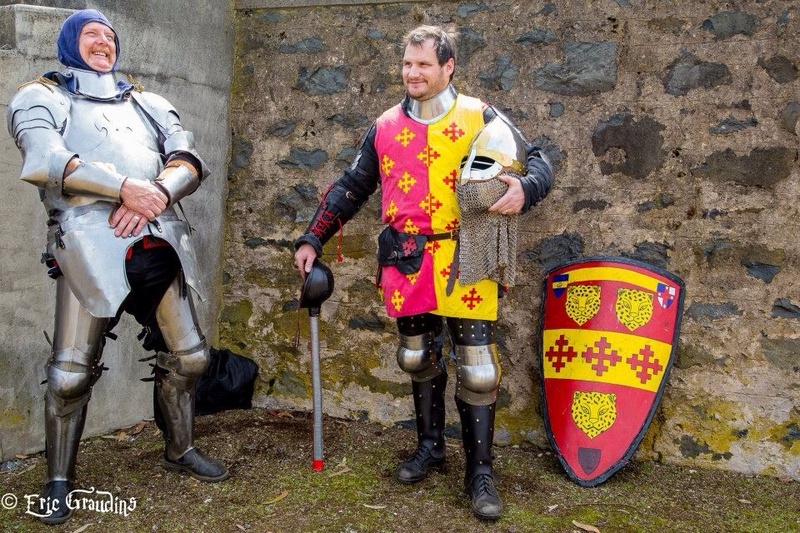 Regular teaching of the combat arts and of dancing has continued throughout the year, and we thank both those who give their time and expertise to mentor others, and those who attend to learn – together you keep these arts and pastimes strong in the Barony. We have seen many members of our Barony recognised for their achievements in diverse fields – while the most memorable was surely Master David de Darlington’s surprise elevation to the Order of the Pelican, we have had the honour and pleasure to see and participate in so many deeply meaningful ceremonies this year, for the contributions of our dedicated and hard-working members never ceases to inspire. Recognition is at the heart of the SCA, so we look forward to continuing to receive your recommendations in the coming year. A personal pleasure of ours for this year has been travelling to events as the representatives of this fair Barony, and strengthening ties of friendship with different groups. We will both be attending Rowany Festival next year, and we hope to have an even greater number of Ynys Fawrians present. While the date change is causing difficulties for many, our cousins in Krae Glas are discussing plans for a joint campsite and food fund for the southern Baronies; if this would assist your plans to attend, please talk to either of us or join the discussion directly on Facebook. There is also a southern camping event, Congregatus Australis, being organised over Easter for those for whom the date change makes Festival impracticable; at least one of us is hoping to be in attendance at this event, and we would encourage you to consider going if Festival is not an option. Looking back, we recall with pleasure the many times we have come together in the Barony to celebrate in the past year. It was a desire of ours to encourage more varied opportunities for getting together, and there have been many of these in 2017. We thank everyone who gave up their time to organise these, whether big or small: all of them have enriched the Barony in some way. Formal events included the croquet picnic in the north, St Sebastian’s, the newcomer’s picnic and tourney, Little Bit of Rapier, Saturnalia, Great Southern Gathering, Lightwood’s birthday, and of course, the splendour and pageantry of November Crown. But we have also come together for monthly gatherings in the far north and south; and in the central Barony for round table discussions, bimonthly picnics and tourneys, and more casual gatherings like A&S workshops and project days/nights, the A&S weekend and potluck bardic circle, and the upcoming movie night. On that note – thank you to all those who attended the most recent picnic, particularly those who fought in the rapier and heavy tournaments in honour of Count Bran; it was a very meaningful way to remember those we have lost. We look forward to many more opportunities to spend time with you all next year – and looking ahead, the calendar for 2018 is already beginning to fill! Our first event, to welcome everyone back for the year will be the Baroness’ Birthday Bash, celebrating Baroness Adelindis’ birthday on 20th January with a rose tourney (both rapier and heavy). Lightwood will be holding their 4th annual St Sebastian’s archery picnic on March 3rd. Plans are afoot to celebrate the Barony’s 25th Anniversary in splendid style on July 6-8th. And of course, the magnificence of the Theatre of Food Feast promises to surprise, delight and awe all those who attend, on December 8th. It has been a privilege, an honour, and a very great pleasure to serve Ynys Fawr as your Baroness and Baroness in 2017, and we look forward to the next year in this role.